Social Media websites such as Facebook, Twitter, LinkedIn and other networking sites provide easy to implement tools enabling you to promote your business to a widespread audience. Get started today by adding social media links to your ESP Website. Social media links are your networking site URLs and can be shown on your ESP Website or Company Store. To include social media links on your site, go to the ESP Websites admin. Then, click on the icon for the social media link you would like to add. A window will open where you can add links to Facebook, Pinterest, Twitter, Instagram, LinkedIn, YouTube, Google+, Flickr and/or your blog. 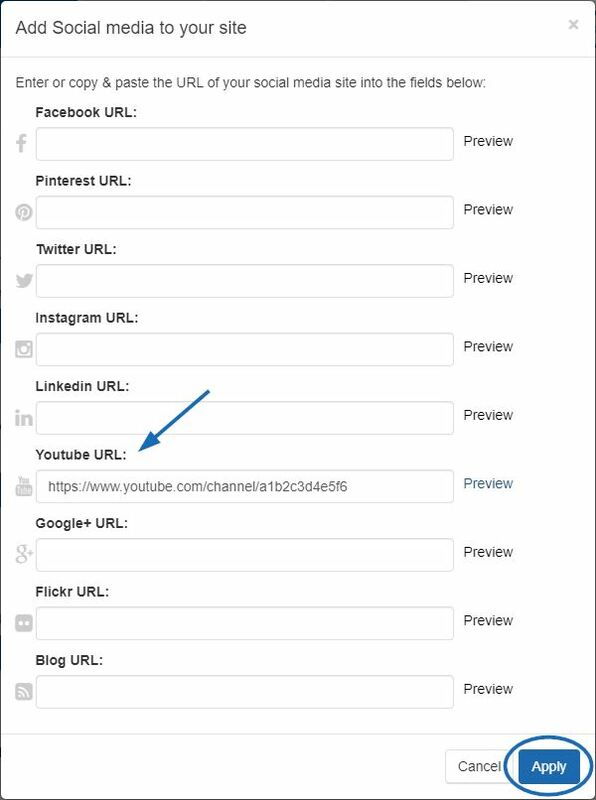 Note: Adding the URL for Facebook and/or Twitter will link to the company page, not put the like icon on your site. When you have finished, click on Apply. Use the instructions available on Twitter and LinkedIn to get the proper coding that is needed. Log into the ESP Websites admin and click on the Edit Site button for the site you would like to use. Expand the Pages & Menus section and then click on Advanced Page Manager. Click on the Edit Page tab and use the Select Page dropdown to choose the page you’ll add the Like button to. From the list of modules on the left, click and drag a Text module into a zone on the right. Do not make a selection from the Content dropdown, click on Save. Once you have the text module added to the page, click on the Edit link. In the Edit Content window, click on the HTML button at the button of the content area. Then, paste in the code. In the Properties box, it is recommended that you add a title and check the Save to Content Library checkbox so that this code will be saved in your Content Library. Click on the Make Changes Live link at the top on the page. 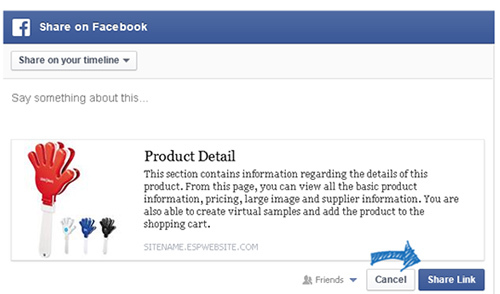 On your ESP Website (or Company Store), there are share links available in the "Share" box of the Product Detail view. Clicking on the icon will share the product on your social media site or open it in an email. The available share links are Facebook, Pinterest, Twitter and LinkedIn. Use the envelope icon to send the product via email. You will be able to add your own information about the product prior to sharing it. For example, clicking on the Facebook share link enables you to review the information prior to sharing it.